This adorable boy is Reggie. 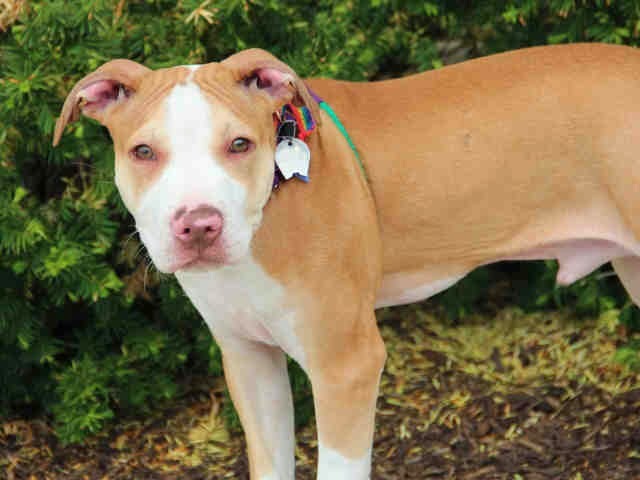 He's about 4 months old and a beautiful tan and white Pit Bull mix dog. Full of all that good puppy energy and quite a cuddler, Reggie is looking for someone with some patience for training. While he's at the Humane Society of Missouri, Reggie is in their dog to dog socialization program and doing very well. He's currently being house trained and learning to walk nicely on a leash. Take a look at Reggie's adoption video and you'll see he's a real cutie. Reggie is currently at the Humane Society of Missouri's St Louis City animal shelter. Contact them at 314-951-1562. Reggie's animal ID number is A572280. Such a love. I hope he finds his furever home soon! Beautiful pup! Paws crossed on for a furever home! What a beautiful boy ... he reminds me of my Toby that passed away from Cancer last year. I will share him and hope he finds a wonderful forever home soon. Such sad eyes. Hope he finds a loving home soon! Oh he is just beautiful! Sharing! Reggie is adorable. We will share too! Reggie is precious! Paws crossed he finds a forever home real soon. Sharing. Reggie is a good looking dog. Hope he finds a home soon. What a sweet baby! I hope he finds a home quickly! I'll share~ Bark More, Growl Less Barking from the Bayou! Hope Reggie finds a good home.